Create profitable business growth with Valpak of Alaska direct marketing products. By choosing to advertise in The Blue Envelope® featuring action-provoking coupons through high-visibility digital channels, you place your business in the hands of thousands of local prospects. We can design and distribute a printed piece that best sells your business. Valpak of Alaska’s digital marketing packages enable you to reach people on the go and in remote areas. Help them find you ahead of the competition with a business website linked to valpak.com. We can develop, optimize and maintain it for you. Valpak works for most types of businesses: restaurants, entertainment and travel, shops, beauty and wellness, professional and general services, health and medical, home and office, and automotive. You’ll get full ROI reporting, too, with our performance and call tracking tools. Valpak of Alaska is a proud member of the Anchorage Chamber of Commerce and Rotary. For specific dates and coverage, contact your Valpak of Alaska representative. 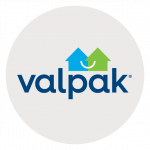 Valpak of Alaska is an independently owned Valpak franchise.